I've always thought mouthwash was fairly superfluous in my teeth-cleaning routine. I never used it. I didn't suffer from particularly bad breath, and I never understood why so many people felt it was necessary to gurgle and spit blue liquid each morning and night. That is until I started doing some research. Turns out mouthwash can have positive therapeutic and cosmetic effects on your entire mouth, clearing out bad bacteria and offering up healthier gums and teeth in the process. Some even whiten your teeth along with your toothpaste. So I realized I was more down for mouthwash than I'd previously suspected, and I wanted to find the right one for me. In doing my internet sleuthing, I learned another big thing in regard to mouthwash: They're not all created equal. Turns out alcohol-free mouthwash is far superior to its booze-laden counterpart. Below, find all the reasons to switch to an alcohol-free option, the differences in how they react with your mouth's bacteria, and 10 of my favorite options. According to Colgate's site, most marketed mouth rinses contain an alcohol, specifically ethanol. Ethanol can cause burning and dryness and aggravate many oral conditions as well as Sjogren's syndrome, diabetes, or alcoholism. Beyond that, studies by BioMed Research International suggest alcohol-free mouthwashes have a better effect on the gloss, color, hardness, and wear of your teeth and fillings. Now, these alcohol-free options still prevent tooth decay, gum diseases, dry mouth, bad breath, and plaque and tartar buildup, as well as work to whiten your teeth. Though, they're gentler and contain natural and often organic ingredients. In fact, when there's no alcohol in the formula, mouthwash can offer anti-inflammatory and anti-fungal therapeutic effects as well. According to Alliance Dental, alcohol in your mouthwash does destroy almost all the bacteria in your mouth, but it's both the bad and good bacteria, which, if you're using the product every day, means bad breath can actually build up as a result of the imbalance of bacteria. Though alcohol-free mouthwash does not completely wipe your mouth clean, it does target more bad bacteria than good, which creates more of a balance in your mouth and leads to healthier teeth and gums. Keep scrolling for our favorite alcohol-free mouthwashes. 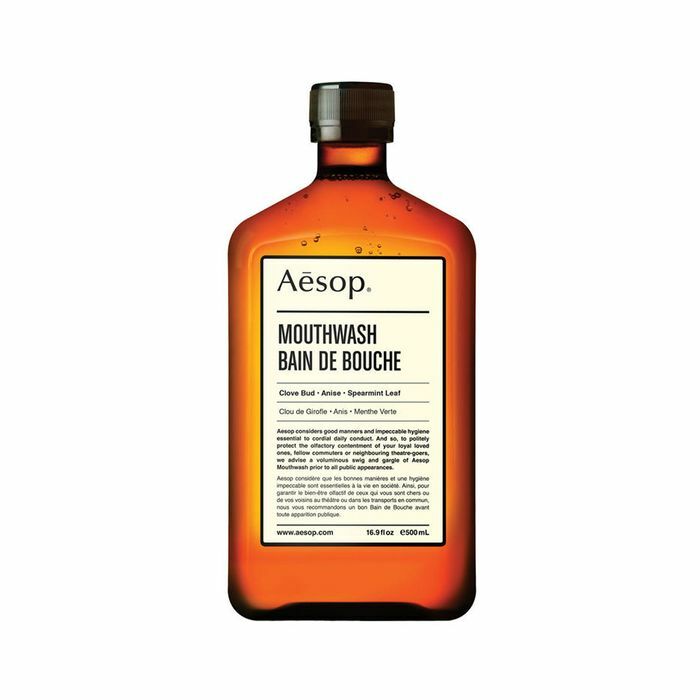 Aesop's alcohol-free formula doesn't disturb saliva production or the natural pH of your mouth. Instead, it offers up botanical and science-backed ingredients like clove bud, anise, spearmint leaf (to freshen and scent your breath with mint), spice, and licorice. Developed by cosmetic dentist Michael Apa, this alcohol-free concentrate is formulated to prevent cavity-causing acidity, plus it incorporates hydroxyapatite to rebuild the surface of your teeth while strengthening enamel and invigorating peppermint oil to fight bacteria. Brandless, a label that offers products for far less than you're used to paying for them, created this fluoride-free, alcohol-free, and cruelty-free option. It's blended with essential oils, won't sting or cause sensitivity along your mouth or gums, and only costs $3. How's that for a steal? This Amazon favorite is an all-natural, herbal formula that works to neutralize bacteria, nix bad breath, and support healthy gums and teeth. It's handcrafted in small batches with ingredients including aloe vera, licorice root, basil, and calendula, as well as peppermint, cinnamon, and tea tree oils. It's gluten-free, sugar-free, vegan, and there are absolutely no harsh chemicals. Crest's formula helps prevent and reduce plaque and gingivitis, as well as control plaque bacteria that can aggravate or cause bleeding gums. That and it's completely alcohol-free and great for sensitive teeth. Marvis's concentrated formula is designed to kill germs and neutralize any odor-causing bacteria—without stripping or irritating your teeth and gums. It's alcohol-free and offers luxury in spades. We know the aesthetic of the bottle shouldn't sway our decision, but, alas, we like pretty packaging. This Leaping Bunny–certified formula contains no alcohol and no artificial sweeteners, flavors, dyes, or sulfates. It's vegan, too, and the mint flavor is my absolute favorite. Listerine's option, an alcohol-free formula meant to provide a nightly reset after hours of eating, drinking, and exposing your teeth to sugar acids throughout the day, is a less intense (but still effective) version of the brand's previous launches. It's gentle, protects sensitivities, and offers cleaner, healthier teeth and gums overnight. You can use this one as a mouthwash and an oil pull, an ancient Ayurvedic tradition of swishing oil in your mouth on an empty stomach for at least 20 minutes to improve oral—and in turn, overall—health. It's flavored with rose, clove, and mint. Tom's mouthwash offers clinically proven cavity protection, plus there are no artificial colors, sweeteners, or preservatives. And it contains naturally derived ingredients and tastes like peppermint. FYI: I changed my diet, and my PMS symptoms went away immediately.